T-Mobile's MetroPCS prepaid brand has made a small but significant change to the rules of its promotional $30 per month plan. Until now the plan has only been available with non-LTE capable phones. As of yesterday, the LTE capable MetroPCS LG Leon, Samsung Galaxy Core Prime and Samsung Galaxy Light LTE phones can now also be used on the $30 plan, and they get access to LTE data. The two phones are pretty similar, both have a quad-core processor, 1 GB of RAM, 8 GB of internal memory and a 5 MP main camera. The main differences are Android Lolipop on the Leon and KitKat on the Galaxy Light and a larger 4.5 vs 4.0 inch screen on the Leon. The Galaxy Light is priced at $79 ($29 after mail in rebate) the the Leon is $99 ($49 after rebate). The $30 plan includes unlimited minutes, messaging and data. The first 1 GB of data is delivered at full speed. After 1 GB is used speeds are reduced to 128 Kbps or less for the remainder of the plan month.Like all MetroPCS plans, tethering and using your phone as a WiFi hotspot are permitted on the $30 plan. 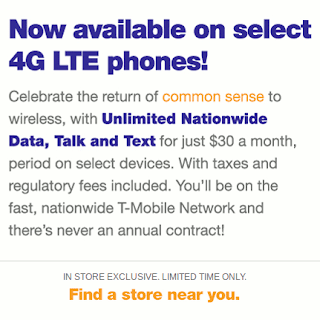 In addition to being limited to specific MetroPCS phones (no BYOP) the $30 plan has another restriction. It's only available at MetroPCS stores, not online. Some stores may charge an activation fee. The LG Leon and Samsung Galaxy Light are also now allowed on Metro's 2 Lines for $50 plan, which is basically two $30 plans with a $5/month family plan discount. MetroPCS service is on the T-Mobile network with free off-network voice and text roaming. Data roaming is not available. Data on MetroPCS is prioritized lower than T-Mobile-branded customers data, resulting in lower speeds when the network is heavily loaded. Based on the lack of complaints I've heard, the lower priority doesn't seen to be noticeable to most users. Update 7/25: Samsung Galaxy Core Prime added to list of eligible phones. MetroPCS offers free activation and reactivation. I am a metro dealer. A lot of Metro stores do charge fees. It's great to hear that you don't. I've amended the post to say that some stores may charge an activation fee. Will I be able to use my own unlocked GSM 4G LTE phone after buying eligible phone from MetroPCS and stay on the same plan ($30/month)? Thank you. No MetroPCS won't let you switch to a phone that's not eligible for the $30 plan. "Data on METRO PCS is prioritized lower than T-MOBILE- branded customers' data, resulting in lower speeds when the network is heavily loaded." If this is true for METRO ( which is completely owned by T-MOBILE) , would it be correct to presume that T-MOBILE also prioritizes its branded customers over its various MVNOs' customers ( PTEL, ULTRA, et al.) " when the network is heavily loaded? Yes it's absolutely true. My customers with Simple Mobile, Ulta, experience differences than as being with Metro PCS or T-Mobile branded services. What GSM customer is asking for arbitrary CDMA-style restrictions on their SIM cards? Hope your phone never breaks - you won't be able to pop it into a backup phone in a pinch. Or use Ultra Mobile for the same price and use any T-Mobile phone or unlocked GSM smartphone. The ability to use any T Mobile lock phone and GSM unlock phone is the real prize not like metropcs that limits you to only use the LG Leon and samsung galaxy lite. that's ridiculous you should be able to use any phone you want. Why the limitation when others mvno don't. It would help your sales and subscribers if you open up instead of putting limitation on things. And another thing is if you want to use a different phone you have to call them and have them swap the phone that's stupid why can't you just pop in the SIM into the different phone. Like every other GSM carrier. I'm sick of their limitations. Although this may be true, they are the only MVNO offering a plan this low with "Unlimited" data. Put a Galaxy S6 on this plan, even throttled, could still blow through a ton of data. They only block LTE devices from using the plan anyways, remember T-Mobile maintains fast 4G LTE more than any other carrier, it's pretty fair... They are opening to select LTE devices for pocket change, $30... $10 more isn't too much more to pay if you really need the data. Boost Mobile, cheapest quality prepaid offers that same deal for $35, now JUST allowing data top-ups.. I agreed Ultra Mobile is the better deal. They give you 1000 internation call and 2.50 credit. same price and talk and text and gig. You lose roaming and good CS. It took me several hours of chat and phone to get my $15 unlocking fee refunded by U.S. Mobile. And their plans expire in morning of expiration date, not at end of day. So I lost some time and money. Am leaving them. UM is good for the basic user but not having the CS you need is inconvenient. It's good if you can support yourself with the service and need the international services. Who cares about roaming when you don't go anywhere. Nobody cares about CS neither. I want something cheap and that it and calls anywhere i want that to me is the better deal. I'am not a business man that goes on trips and need to talk to CS on a constant basis. I'am a pay my fee and and let me go about my business type of guy. Exactly -- different strokes for different folks. If you don't go anywhere, why not just stick to your landline? I was just talking to someone in Russia and they have a LOT more competition (and is less regulated) in mobile carriers there. He can get 30GB for $22 a month. No typo there. A plan that includes UNLIMITED data use at night, and it is all LTE. 50GB plans are about $40 USD. The MetroPCS plan is terrible compared to that. So is everything in the US, including Cricket. Something to keep in mind, to just realize that even if the values look relatively good, the US mobile carriers are really sticking it to us, bad. Next time you see John Legere (as just one example), realize he is not some sort of Prometheus bringing great value to the masses.... but instead a snake-in-the-grass who is rooking his customers badly. Does the 2 lines for $50 plan have all the restrictions of the $30 plan? And does a dealer have to activate that plan as well? The 2 lines for $50 is the $30 plan, just reduced by $5 for the family plan. Yes, that's a deal you can only get with dealers. And is limited to the same phones plus every 4G-only device. is this only because the lte bands on these phones are limited (aka not new band 2?) and really will only work many places as a 3 or 4 g phone??? always seems to be a catch???? just wondering??? I think MetroPCS is restricting the $30 to relatively low end phones to encourage users to upgrade to a more expensive plan if they want a nicer phone. Thanks for the reply info.. Dennis!! thanks again for keeping us informed! How can someone buying a phone and the $30 plan be sure that they really will let you stick with that price? Also do the limitations people complain with internet apply to just calling and receiving calls which is basically all I do with a phone? Running into a plan upgrade problem with Metropcs. Got a Kyocera Hydro Wave on 11/12 with the $30 plan. 1 GB high speed didn't last long, wanted to upgrade to the $60 plan. Paid $30 for the new month starting 12/12. Tried to upgrade online on 12/17, they wanted $110 for the next month, called Metropcs and was given the same figure, so I thought I'd wait until the end of the billing month. Tried upgrading 1/8 with 4 days to go, they wanted $89. Tried again 1/9 with 3 days to go, they want $88. Seems like there's a $25 charge to upgrade plans?